WASHINGTON — President Donald Trump tweeted that there would be "NO change" to Americans' 401 (k) benefits in tax reform, but a top House negotiator on taxes said Wednesday that tweaks to retirement savings may still be on the table. Speaking at a Christian Science Monitor breakfast with reporters, House Ways and Means Chairman Kevin Brady, R-Texas, declined to rule out changes when asked whether Trump's position had killed the idea. "We think in tax reform we can create incentives for Americans to save more and save sooner, which can help," Brady said. "We are exploring a number of ideas in those areas." Is GOP Going to Cap Retirement Savings to Pay for Tax Cuts? While he did not offer details, Brady said there were "continuing discussions with the president" on the topic. Trump ruled out changes to 401(k) benefits on Monday in response to reports that Republicans were considering lowering the amount of tax-privileged savings Americans can contribute to their plans in order to raise revenue for cuts elsewhere. On Wednesday, the president took credit for "very quickly" squashing prior talk of limiting 401(k) contributions, but he also seemed to confirm Brady's suggestion that retirement benefits are under discussion. "Maybe it is and maybe we’ll use it as negotiating," Trump told reporters at the White House. "But trust me, that’s one of the great things, you know, there are certain elements of deals you don’t want to negotiate with — 401 (k)s — and Kevin knows it, and I think Kevin Brady is fantastic, but he knows how important 401 (k)s are." While Brady said a decision had yet to be made on retirement benefits and several other key issues, he emphasized that a final bill was coming soon. If the House passes a budget this week, he plans to release legislation on taxes next week. 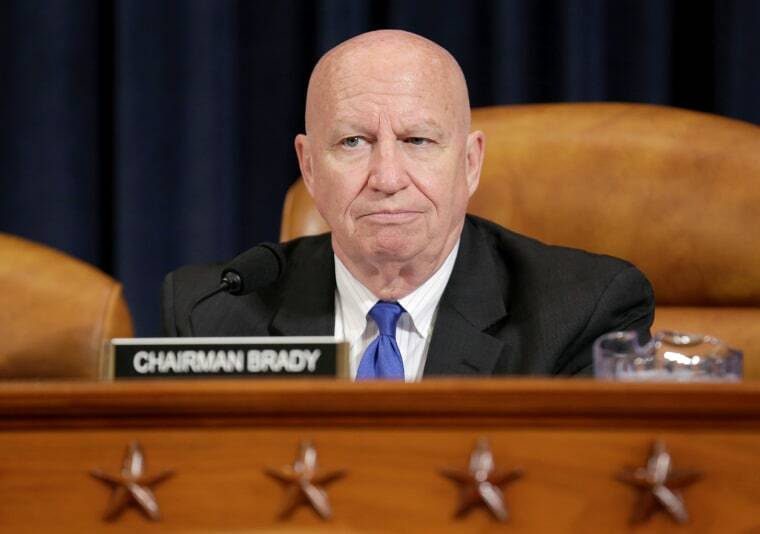 Brady predicted there would soon be an agreement among House Republicans on one of the most contested elements of tax reform so far: the state and local deduction. Republicans from states with higher tax burdens, like New York, California and New Jersey, have complained that eliminating the deduction would raise overall taxes on many residents, but it's a crucial revenue raiser to help pay for the GOP plan. Brady said he was close to a deal with these members that would limit the changes and suggested the key might be maintaining certain benefits for property taxes. "I do expect to reach an agreement with our high tax lawmakers because I think it's vitally important that we help Americans keep more of what they earn regardless of what they live," Brady said. Trump and his allies have sold the tax plan as a middle-class tax cut, but outside analyses of the initial framework have suggested its benefits are concentrated among the wealthy and that some middle-class families might pay higher taxes. Brady also said no decision has been made on what the top rate for earners should be, which was initially pegged at 35 percent in the GOP framework, down from 39.6 percent today. He did say his bill would maintain "head of household" status for filers, which experts have said is necessary to prevent a tax increase on some single parents. House Republicans are likely to keep the 39.6 percent bracket, according to one lobbyist with knowledge of the negotiations. Brady declined to define what "middle class" means at his Wednesday event, saying it varies based on cost of living. He also would not guarantee that the GOP bill would lower taxes for everyone, instead suggesting all Americans would at least be indirectly "better off" thanks to the economic growth that he predicted tax cuts would help encourage. Amid the conflicts between Trump and key GOP senators heading into the tax push, most recently the decision by Sen. Jeff Flake of Arizona not to seek re-election next year, Brady emphasized that his own relationship with the president was "excellent" and that they talk regularly about the emerging legislation.